The first batch of athletes dash to the top floor of the building, which is 474 meters, around 7:30am. 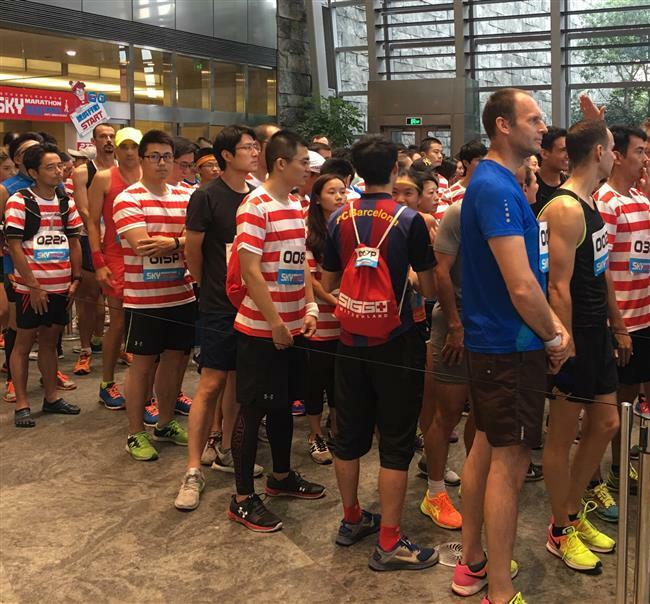 About 1,000 athletes and residents from over 20 nations participated in a stair-climbing race at the Shanghai World Financial Center, the city's second-tallest building, this morning. 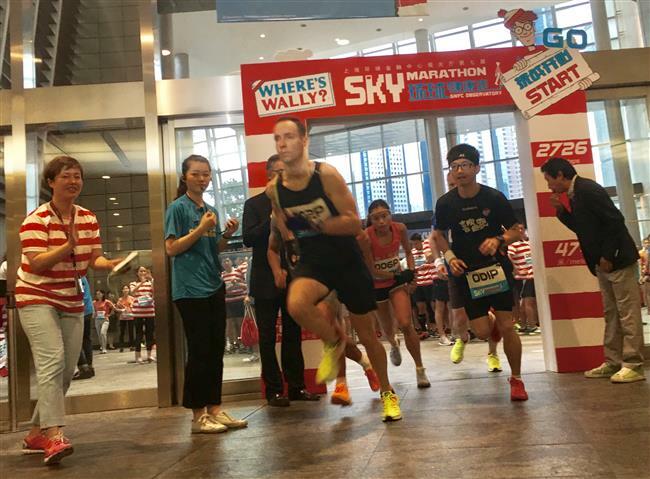 Participants have to climb a total of 2,726 steps to the building's 100th floor at 474 meters, the highest climbing race, dubbed the "sky marathon," in the city. Some 300 professional athletes and 700 residents, including those from the United States, France, Japan, Australia, United Kingdom, Germany and Italy took part in the event. "I have no ambition but just to enjoy the fun of tower climbing," said Jan-Peter Bender from Germany, an engineer living at Jinqiao in Pudong. He Liangliang, a marathon enthusiast, won the male's top prize by reaching the top of the building within about 17 minutes. Yue Qinghua, a local swimming coach, won the female champion by finishing the race in about 21 minutes. The center has held the race since 2011. More similar races will be held in the building to encourage locals to take part in sports exercises, the management of the building said. The exhibition on the 94th, 97th and 100th floors runs through the end of December. Displays on the 423-meter Sky Arena 94 include six sections about ancient Egypt, the Colosseum, the Crusades, pirates, the US gold rush and the future. Wally’s distinctive red-and-white-striped shirt, bobble hat, and glasses make him easier to recognize among these sections. The center also launched a campaign from today that those who wearing striped shirts can receive a 100 yuan (US$15.2) discount on the entrance ticket which costs 220 yuan to normal visitors. The discount campaign will run through the end of October.